Talk about pressure. I’d imagine that shortly after mastering your ABCs, adults stood over you during a family party expecting a charming answer. You would have breathed a sigh of relief when the adults smiled and patted your head after you blurted out the first thing you remembered from your community helpers picture book. Career contemplation. 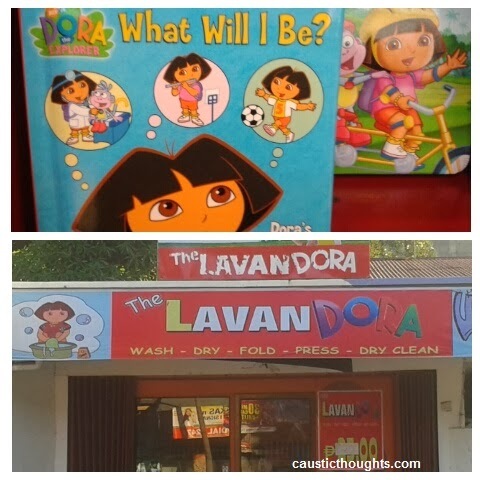 In the end Dora decides to pursue her lifelong passion. It took many seconds before I could think of an answer for my adults. I was thinking I didn’t want to be an engineer like my father because his textbooks had scary looking squiggly characters on them that looked like they came from a can of worms. At that time, I did not want to be a teacher like my mother either because she always looked like a bag of nerves. So I told them I wanted to be a dentist. But I was as likely to jump into the field of dentistry as my molars were from developing athlete’s foot. After watching several episodes of Star Trek, I decided I’d rather be an astronaut instead. I quickly abandoned the idea when I found out that I could not even “Find X” (X seems perpetually lost too) in high school and that owning a scientific calculator does not make people develop an understanding for calculus. I’ve had to undergo several different mutations where I thought I finally figured out the perfect identity. It’s seems however, that it’s now really anyone’s guess what I want to be or what I am now. Unlike Bong Revilla who is absolutely certain that he is a senator and not a thief or a wolf in senator’s clothing, I have absolutely no idea what I am. I’ve given up trying to put a deadline on becoming a successful someone because I realized that the more I panicked, the more I missed out on other things like sleep, food, fun, my kids’ birthdays… oh, and is that my life passing me by? I didn’t even recognize it. So I resolve to be calmer. The answer to that decades old question will come to me and it doesn’t have to be right this very minute. We are of course, dreaming to become one someday, but the wind blows differently from what we expected to be. Try to live the life you're in, at present and don't worry about tomorrow. Just enjoy your life, every minute of it. I wanted to write but ended up to be a CPA/Auditor so when I got myself established I'm now back to my original passion of writing. hahaha! It's like we are having the same problem. I graduated HRM but still IDK what to do with my life. While I continue to know what I really want, I just enjoy blogging and generate money through online selling. I know eventually, I'll get to know why I was born and what should I do with my yet-to-discover talent. :) May God bless us with our endeavor. Up until now with my career and all, I still cannot answer that question straight. What do I want in my life? Just to be happy - simple but complicated at the same time. I can't remember any incident that I answer straight what i wanted when i was still young. it seemed i just went with the flow and i ended up working in a bank. now that i'm already a housewife, i think i would say that i just wanted see my kids grow up and be happy. I wanted to be a doctor but my parents can't afford it. I took medical technology instead thinking that I could pursue my dream somehow but I landed on fields that are way too far from my dream...telecommunications and writing. Let me share what I wanted to be, I originally wanted to be a lawyer. I'm already in my late 20's and until now I haven't entered law school yet. my dream changes as i grow up... but not everything really happens as planned... my faith says, it has a deeper purpose. Yahweh bless. I think at one time or another, we go through this kind of feeling. Iused to want to be a cop but locking criminals behind bar didn't sound like fun anymore.. so I'm blogging. I always wanted to be a Flight Attendant when I was young because I dream of traveling.